A surgery-free, drug-free noninvasive treatment to reduce pain, inflammation and speed healing. How it Works. The laser light is delivered through a noninvasive handpiece to treat the affected area. Your pet may feel a gentle and soothing warmth. Most treatments take a matter of minutes. What are the costs? Treatment protocols are unique to each patient and condition. Therefore, treatments will vary in time, complexity, and cost. 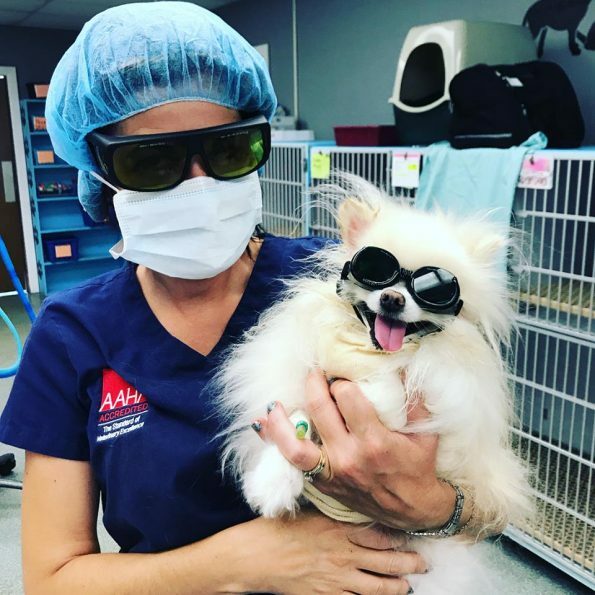 Laser therapy can be used to enhance other treatment plans recommended by your veterinarian. Evidence: There is a vast body of research supporting the effects of photobiomodulation (PBM). For PBM to occur, a therapeutic dose of light is delivered to impaired or dysfunctional tissue, which leads to a cellular response mediated by mitochondrial mechanisms that reduce pain and inflammation and speed healing.1 There are a number of factors that can help maximize the amount of light that reaches target tissue, including: proper wavelength selection, sufficient laser power, reducing reflection off the skin, and minimizing absorption by molecules not involved in photobiomodulation.